The Euro sold-off in yesterday’s session following the report from the European Commission that showcased slowing growth and inflation perspectives for this year and signs of a possible economic downturn in the EU. The US Dollar's bullish momentum faded in the afternoon, as several Fed officials gave out conflicting sentiment regarding interest rates. Today will be a quiet day in terms of macroeconomic releases, as the only event scheduled is German December Trade Balance which might moderately impact the pair. 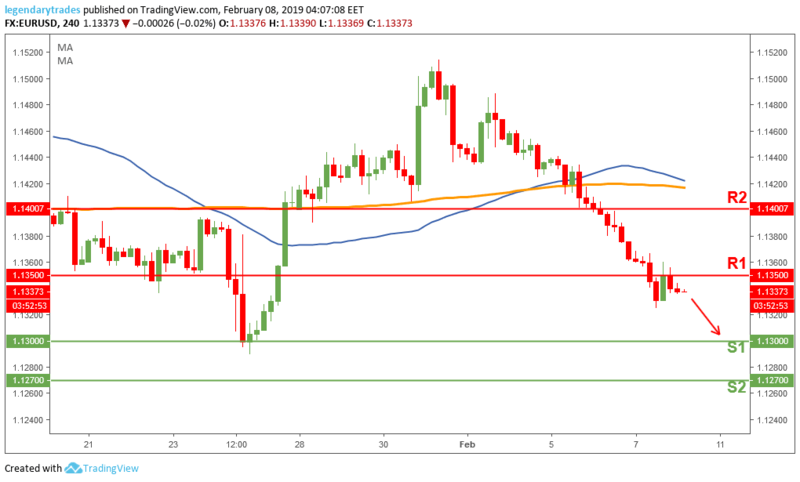 The Euro bears continue to be in control as they broke below 1.1350 previous support level which became resistance, showing signs of negativity yet again. This weak price action is indicating that the Common Currency is likely headed to the next support level 1.3 (S1). The bulls need to break back above 1.1350 (R1) to regain control and stop this short-term down trend on the Single currency.